Best Back Scrubbers for Fighting Bacne - Backless Dress, Here I Come! Q: How Do You Exfoliate Your Back? Q: How Often Should You Exfoliate Your Back? Q: Does Scrubbing Your Back Help With Acne? Q: How Do You Wash A Back Scrubber? Q: What’s The Best Electric Back Scrubber In The Market? Taking a bath should be a relaxing and refreshing experience for everyone and never a struggle. But, when you’re not flexible enough nor gifted with double joints, reaching your back to give it equal amounts of TLC that you’re giving your body can be such a sweat-inducing task. Perhaps you’re still using regular scrubbing mitts, a short loofah from the dollar store or that mesh loofah you got as a freebie when you bought your body wash, while this works well for your body, it may be a struggle to use it on your back. It’s about time to replace your fave bath time tool with something more back-friendly – with the help of the best back scrubbers! These scrubbers come in different forms: Bristles with a long handle (can be natural or synthetic), loofah (plant-based) with a handle, stretchy cloth-like material, mesh towel, double sided scrubber/massager, even a hands-free one! I reviewed the best loofah back scrubber and brush back scrubbers available in the market down below to make things easier for you (Got your back, amigo! Literally!). Who doesn’t love double duty products? Voda Reve minimizes your bathroom clutter by offering you two products in one. Their amazing back scrubber features two different textures on each side. You get soft, plush cotton that lathers up your soap nicely for gentle cleansing on one side and a deeply exfoliating loofah texture on the other, perfect for sloughing off dry skin, eczema and minimizing bacne. Another good thing is that this scrubber is machine washable, just throw it on your washer, let it dry and it’s fresh like the day you bought it. Totally hygienic! The best back scrubber for acne that you can get out there! 30 x 4 inches (L x W). Dual-sided for varied levels of exfoliation. Handles on each side ensure there are no missed spots (you can use it to hang this nifty tool too!). 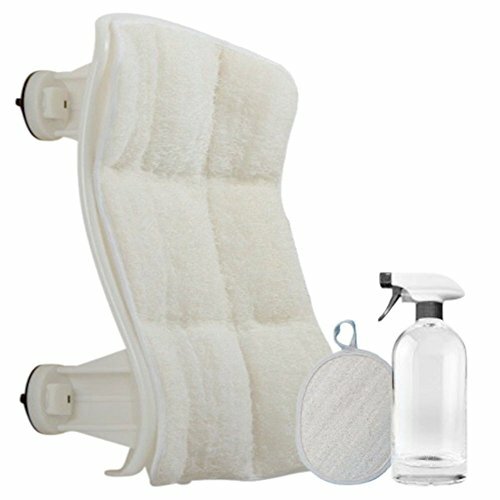 May not be the best for people who need more control when scrubbing their back. Unlike traditional back scrubbers that have a long, firm handle, this one is soft. It gets the job done pretty well since it can hug your curves but might be too flimsy for some. Not flexible enough to reach and scrub your back? No biggie! This Luffoliate back scrubber can be used hands-free! Just prop it on your bathroom wall with its 4 strong suction cups and rub your back against it! It’s that easy! Once you’re done, just detach the loofah pad and pop it in your washer. Pads are built to last and can be used with maximum efficiency for 5-6 months before it needs replacement (replacement pads are available for purchase). Excellent back coverage (it even comes in different sizes in case you need a bigger or smaller one!). Ergonomically designed to hug the curves of your back for efficient exfoliation. Made with 100% organic loofah. Easy installation with 4 sturdy suction cups. Yes, it’s hands-free but it doesn’t mean you won’t use your upper body (and a bit of your knees to lower yourself) to at least rub your back against the loofah pad. Suction cups may not work on certain types of tiles/surfaces. Truly a stroke of a genius, this body scrubber not only exfoliates and stimulates blood flow, but it also helps reduce the appearance of cellulite through its unique honeycomb design. This design also helps create that creamy, luxurious lather even with a small amount of body wash or soap, you’d end up looking forward to showering time each and every time! Handles on each side ensure there are no missed spots (you can use it to hang it too!). 100% hygienic with its anti-fungal, anti-bacterial and mildew resistant properties. Seems a bit short for my liking, but ok, it’s stretchy anyways! Good exfoliation without breaking the bank, that’s what this dual-sided scrubber is all about. Made with synthetic Nylon bristles, it offers medium to hard softness making it the best exfoliating back scrubber for people who are prone to bacne or simply to those who wanted a more thorough cleaning. Its length offers the right amount of control without having to twist yourself like a contortionist just to give your back a good scrub. Simple, yet effective, you won’t go back to regular scrubbing mitts ever again. Bonus: The massage head works like a charm in undoing knots or tension points on your back! 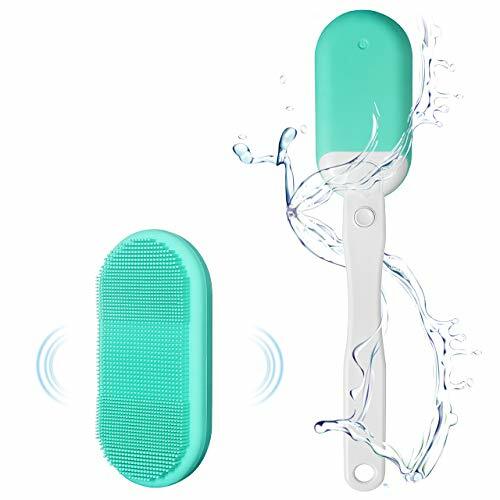 Dual-sided back scrubber massager (One side has nylon bristles to exfoliate while the other has a ball massage head for removing the knots and improving blood circulation). Offers medium to deep exfoliation. Has a ribbon for hanging. Synthetic nylon bristles feel quite stiff when used on the back, but hey, it does the job! The materials used look and feel cheap like it won’t last that long. No indication if it can be used wet/dry. Need an extra-long back scrubber? Bath Blossom heard your plea. With its 17.5 inch handle, you’ll never fall short! Long enough to reach the depths of your back, this scrubber is dual sided to fit all your scrubbing needs. Made with natural materials, this brush can be used wet or dry, and guess what? Cleaning is a breeze too! 17.5 inch handle (actual head not included in the measurement). Dual-sided for varied levels of exfoliation (stiffer/softer bristles). Made with natural materials (bamboo for the handle and boar bristles for the brush). Has a rope for hanging. While it is good that it is made out of natural materials, this brush is not anti-microbial in any way and can easily form molds. Given that, I can say it’s not built to last. There is some truth to the adage “out of sight, out of mind”, being unreachable and hard to see, it’s easy to understand why our backs can easily be neglected. For some people, the only time they start worrying about how their backs look like is when they need to wear something revealing (like a backless dress, halter tops or swimsuits) and only then do they find out they have bacne or dark spots caused by it. Exfoliation is the removal of dead skin cells and deeply seated dirt found on the surface of our skin. Using back scrubbers can ensure that your back is exfoliated evenly and thoroughly, revealing a fresher, brighter and smoother layer of skin immediately after washing. Since back scrubbing can exfoliate the skin, it removes sebum, dirt and dead skin cells that may clog pores and cause pimples, blackheads and ingrown hair bumps. Scrubbing every other day not only minimizes the occurrence of bacne and blackheads but also lightens old acne spots leading to a flawlessly smooth, display-worthy back. Who would’ve thought that a simple back scrubber can actually do this? Amazing isn’t it? As scrubbing stimulates blood flow, it also can also help in draining your lymph nodes of toxins and waste leading to a smoother, more even skin. That friction created through scrubbing stimulates and opens up your capillaries (those little blood vessels near the surface of your skin) allowing blood to flow in. Blood contains vital nutrients and even oxygen that our skin cells need to repair itself and regenerate and so having good blood circulation ensures your skin is nourished from within giving you that healthy, youthful glow. Tip: You can use your back brushes (natural boar bristles are the best for this) wet or dry (this technique is known as dry brushing) to improve circulation. Just brush it towards the heart, starting from your toes, slowly going upward. How much is your budget? How long do you plan to use it before replacement? These are just some of the important questions you should ask yourself before deciding on which back scrubber to buy. There are lots of cheap back scrubbers out there some are really good while some are made out of cheap materials that won’t even last a week (hey, you get what you pay for) and then there are some pricier ones that are really top-notch quality. The reviews above should help you to choose wisely. Whether we’re talking about handle length (for brushes) or the total length of mesh/band type back scrubbers, we want it to be long. Long enough to reach all the corners of our back with minimal effort. 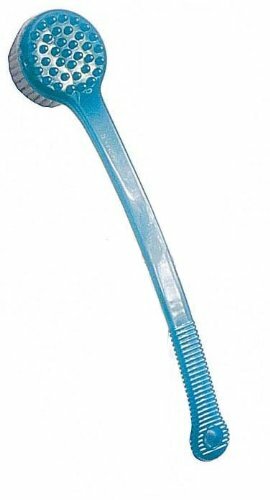 15-17 inches handle length is the best for back brushes, while 30 inches is a good length for mesh/band type scrubbers. Some days, you just need gentle cleansing and on other days you need a more vigorous cleanse. Why buy two different products when you can buy 1 with both textures? I’m a sucker for dual textured or multipurpose products and I tend to gravitate towards such products because it feels like I’m saving money doing so (cheapskate alert – don’t hate me)! Natural materials such as bamboo, boar, etc. are good for the environment but only several are built to last. Wood brushes do last long, but only if you’re ok to use a moldy, gross brush. Yes, that’s the reality of it. I’m a fan of body brushes, but if there’s one thing I hate about it – it can get moldy real quick. Have a spare one just in case or just get the band type such as the Supracor or Voda Reve – those are built to last and super hygienic. While most scrubbers have either one, there are some that don’t. Back scrubbers require to be air-dried, so this feature really comes in handy. Plus, who wants to add to the bathroom clutter? No one! Hanging your bath essentials is one way to save on counter space. Make it a habit to look closely before hitting that purchase button! No one wants to use a moldy, funky-smelling scrubber. Splurge a little and get one with anti-microbial properties. You’ll save a lot in the long run as you don’t have to keep buying a new one when things start looking (and smelling!) gross. A: Most of us are not gifted with flexible arms, thus, using a good back brush or back scrubber loofah is a big help in making sure that our back is thoroughly exfoliated along with the rest of our face and body. For extra exfoliating powers, you may also use a salt scrub with your fave back brush. I personally love the brand Abonne. It leaves my skin baby soft and smooth at a pocket-friendly price! A: As much as we want to feel totally clean and exfoliate daily, we can’t do that. Exfoliating, when done excessively, can cause your skin more harm than good. It can cause redness, increased sensitivity and even tiny tears or scrapes on your skin. Exfoliate 3-4 times a week. That means, you can exfoliate every other day but never consecutively. A: It does help but only to a certain extent. Acne is commonly caused by clogged pores which can easily be avoided through exfoliation and thorough cleansing. 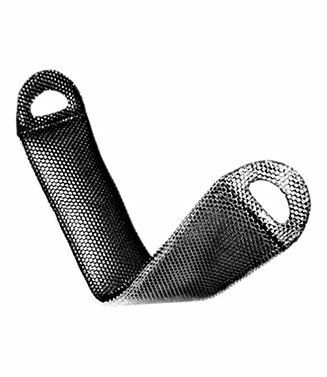 Back scrubbers can help minimize the appearance of new bacne but not cure the existing ones. For existing bacne, you may need to replace your regular soap with a medicated body soap or wash. Choose one that contains any of the following: Salicylic Acid, Tea Tree Oil and AHA. For more info on soaps and moisturizers containing the above-mentioned ingredients, read here. A: It depends on what type of scrubber you have. Soft ones, mostly made with loofah, cotton and some sort of mesh materials can easily be thrown in the washer for cleaning. Those that come with a handle can only be rinsed thoroughly with water. You can’t even sterilize them with hot water as it may affect the quality of the brush. With that being said, the soft, stretchy ones are much easier to clean and if they come with anti-microbial properties (like the Supracor Stimulite mentioned above), then it’s a sure winner! A: Whether you have poor muscle control or just feeling fancy and wanted a very extra back scrubber, Innerneed’s Waterproof Electric Body and Facial Cleansing Brush is a good choice. It has silicone bristles that efficiently exfoliates while still being soft enough for people with sensitive skin. With 5 levels of cleansing to choose from, you can easily go for a gentle cleanse to a deeper cleanse with just a touch of a button. The best thing of all? This waterproof beauty can last a full 90 days on one full charge. The best back scrubbers are like a detox for your back, it offers a lot of benefits other than just cleansing. It’s about time that you treat your back fairly and give it the same care that you would for your face and body. Try my recommendations above and see and feel the difference it makes. Have you tried any of my recommended products? Let us know about your experience and help other women make a smart choice when choosing a back scrubber. Got some cool products you’d like me to try? Drop me a line and I’ll feature it on my next blog. Always remember, I got your back girl! 9 Best At Home Facial Steamers – No BS, Only The Good Ones Here! 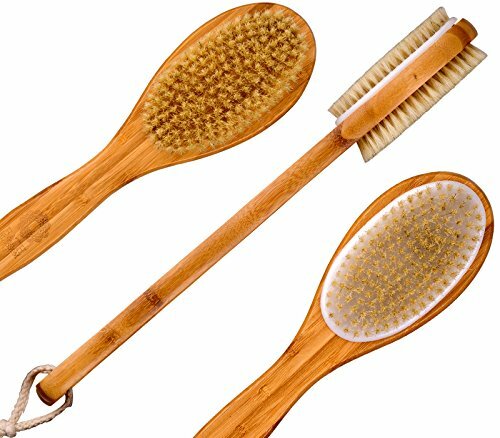 7 Best Dry Body Brushes 2019 – What is Dry Brushing? Is it Worth it?